Long story short, as a “Misaeng” fan who’s been waiting for this drama to air — how could I not get excited when Kim Won Seok (Misaeng) sits on the director chair, Kim Eunhee (3 Days, Sign, Harvest Villa) writes the script, and an ensemble of credible actors (Kim Hyesoo, Cho Jinwoong, and Lee Jehoon among others) grace the screen? — I am not disappointed. So far. I am just being extremely cautious as this drama gives more heartbreaks than I have anticipated for a crime-thriller, and more profound tears than your average tearjerker melodramas. I’d like to think I am a rational person. That is enjoying things in their correct ratio, including aspect ratio. Nitpicking the surreal anamorphic visual due to incorrect aspect ratio projection whilst watching Lee Jaehan (Cho Jinwoong) grieving is alienating. So the switching back and forth between 16:9 aspect ratio for the present (Park Haeyeong’s) time and possibly 2.35:1 — but I choose 2.21:1. 2.35:1 is too claustrophobic to my liking — for the past (Lee Jaehan’s) has become normal, albeit trying. The two time-lines collided in the one frame. As the communication grew intense, this “collision” gets more frequent. Not to mention the preceding and subsequent scenes, in which they were going back and forth in time. I… gave up switching to the correct aspect ratio. “Signal” has managed to engage audience by raising more questions as the story unfolds. Could “aspect ratio” be one of those important questions? Because something about this particular choice of contrasting aspect ratios is intriguing. Why are the past scenes screened in a “wrong” ratio? It could have used letterboxing to keep scenes from Lee Jaehan’s time in correct aspect ratio. 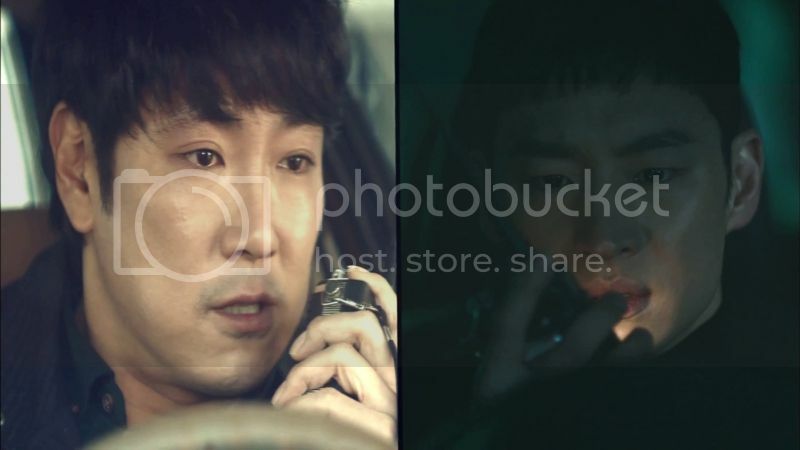 Why the drama uses different aspect ratio as marker instead of (the usual) tint or colour for the different time-space? Could the aspect ratio serve a narrative function, more than just being a time marker and differentiator? A mark that the past was skewed or distorted? Will you review the series? I’d like to read it.